Santos Laguna are 1-0 up against Chivas in the second leg of the Liga MX semi final on Sunday night. The first leg ended 0-0 on Thursday – but with this away goal Santos are now just 45 minutes from the final. Djanny was the scorer, sliding Nestor Calderon’s cross into the net from close range in the 38th minute. It would be a remarkable achievement if Santos can make the final. They only qualified for the playoffs on the final day of the regular season, sneaking into the post season in 8th place. 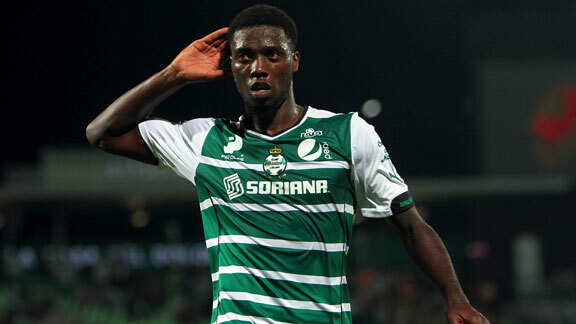 Djaniny arrived at Santos last summer, arriving in a multi million pound deal from Portuguese side Nacional. He represented Benfica when he was younger, but could never hold down a first team place. The 24 year old also has 19 caps for African side Cape Verde since making his debut in 2012.